Is equal to or ? To ensure we all get the same answer for maths calculations the order of operations has been determined. 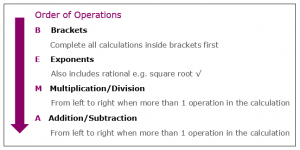 Calculate the inside of brackets first, then exponents, then multiplication or division, followed by addition or subtraction. BEMA is the preferred mnemonic, as there is no order between multiplication & division, and no order between addition and subtraction. NOTE: Scientific calculators will perform the correct order of operations. However, take care when entering calculations as part of a fraction into a calculator, and use brackets around the denominator and numerator of any fractions involving calculations.